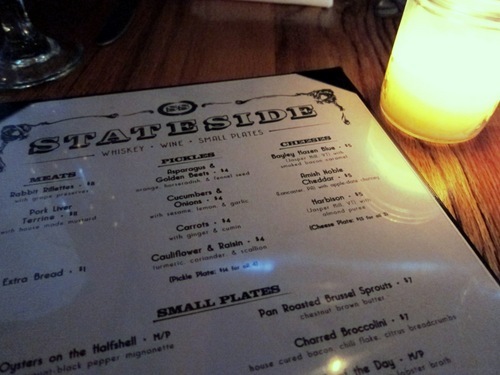 Stateside is a small plate spot that opened off East Passyunk. It’s small, cool, has a big focus on wine and whiskey, and serves up some delicious locally-sourced bites. 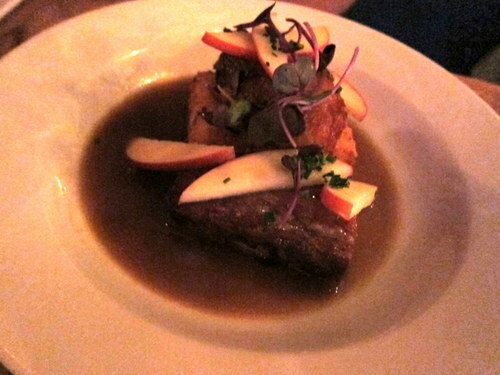 E and I dined there a gazillion months ago and I’m finally blogging about it! I’m pretty much of a weenie when it comes to cheese. I didn’t really grow up eating it (did they even have cheese in South Korea in the 70’s and 80’s?) so while I love mac & cheese and baked brie, I’m not someone who would be sad if cheese disappeared from the earth. But I’m trying to be better about it. We got cheese! 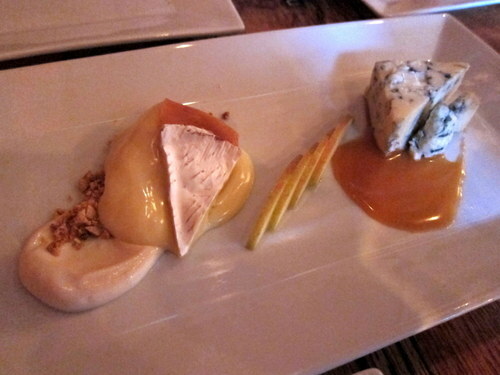 Here is the bayley hazen blue cheese with smoked bacon caramel and the harbison with almond puree. Stinky cheeses are really not my thing, so while I tasted the blue, I was much more of a fan of the smoked bacon caramel. Smoked bacon caramel! Yep, just what it is – delicious caramel with a hint of bacon. They need to bottle this stuff. The harbison was great, smooth and mild. 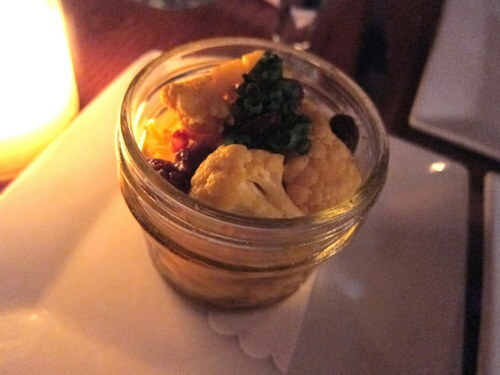 An adorable mason jar of cauliflower and raisin pickles! I love fresh pickles. And considering that cauliflower is pretty boring plain, the pickling gave em just the right amount of flavor. The raisins were a surprisingly sweet touch. E and I both love beets, so whenever we eat together, there’s a good chance that if beets are on the menu, we’re ordering it! This one had red and golden beets, plus shredded pear. And those little sprouty things I love. 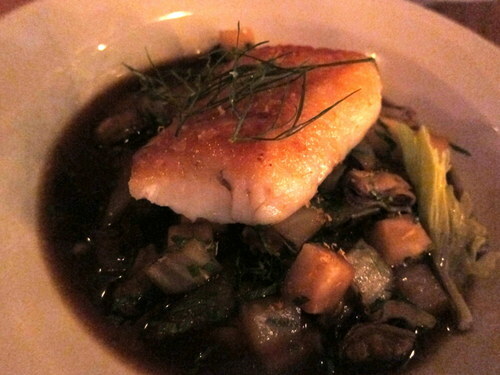 It ain’t no fluke that we ordered fluke! Ok, I’ll stop now. I’ve noticed that whenever E and I go eat, we also order fluke. So fluke and beets seem to be a common theme. I rarely get to eat dessert when I eat out because I’m usually way too stuffed. That’s why I love small plates so much, as it’s easier to leave room for it. The chocolate torte! 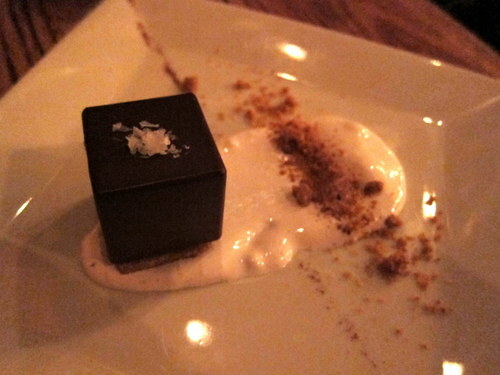 So small and cubic, but so rich and chocolatey. 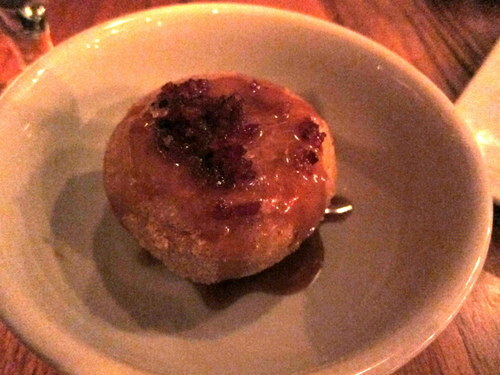 But what I ordered is the dessert that everyone was talking about – the apple stuffed doughnut with vanilla bean caramel and candied bacon. It was dreamy, it truly was. I love apple stuffed anything, so I liked the donut as it was. But the caramel with candied bacon? Yes, please! We thoroughly enjoyed our meal here, and the service was great and friendly. 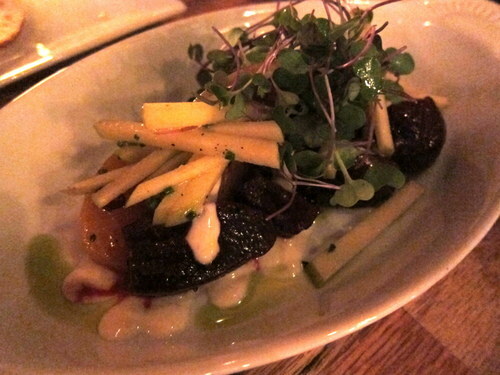 We’re definitely going back to try some more small plates!